Using insurance postcards creates exceptional opportunities for agents. Marketing using postcards in particular can reap excellent rewards in the insurance industry if you focus on three important factors – relevant data, delivering a clear message and ensuring a consistent execution. Having relevant data on prospective customers is more than useful in insurance marketing with postcards – it’s essential. For one, being able to discount unsuitable candidates from the beginning reduces costs. Nielsen Prizm Data provides an easy yet highly effective way to do this by provided individual agents with scientific data analysis is easy to understand, pre-recommended market segments. The real power of modern postcard marketing comes into effect with paired with event-driven marketing. Instead of passively offering insurance over a wide spread of prospects, use real-time trigger data to decide exactly when to send your insurance marketing. With the right life event data, such as notification upon births, deaths or home purchases in a prospect’s life, you can have your marketing in their hand right when they are primed to make an important insurance choice. With this reactive marketing, you could have a postcard for homeowner’s insurance out to them upon the purchase of a new home, a postcard for life insurance for the birth of a new child, or car insurance upon the purchase of a new car. It is an incredibly powerful and efficient form of direct marketing. 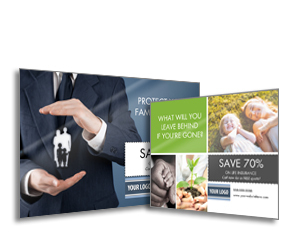 With insurance marketing, getting the right message on your postcards is more than just a means to a higher conversion rate, it is a regulatory requirement – insurance agents cannot use excessive promotional offers as part of insurance marketing for regulatory reasons. Don’t worry about this too much, however, because this would be wrong message to put on your insurance marketing anyway. Consumers don’t want to purchase insurance from a dubious outfit that promises to be the cheapest or offers a free alarm clock. 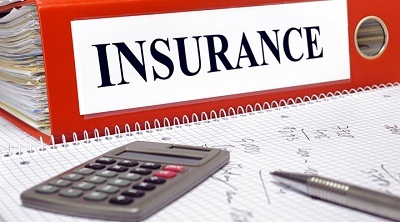 With insurance they need to know that they are purchasing from a dependable, large company that they can trust. They need to know that the insurance company will have the ability to pay out if something should go wrong, and that they will be able to trust the company to do so. Perception is often reality. A subtle way to go about this is to focus on education-based marketing. Offer tips, guides and information, helping to show that your company is fighting in the consumer’s corner. You are their advocate and trusted partner all the way. Although event-driven marketing does allow us to be there for our prospect when they might need us the most, it is the ongoing marketing drive that will pull in the largest number of customers in the long run. Receiving a postcard on a periodic basis reminds the prospect that you are always there, ready to have their back when they need you. Purchasing insurance, for most people, is a decision that takes time. You cannot expect your prospective customers to rush; you simply need to remind them why you will be the best choice when they choose to purchase. Continuing to send postcards and direct mail with a consistent design and brand message will cement the name and values of your company in the consumer’s mind, until finally they can trust you and decide to purchase one of your products. 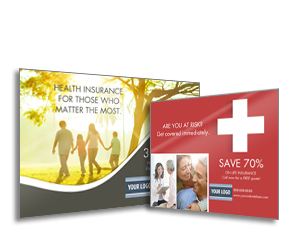 Insurance marketing through direct mail and postcards is a tried-and-tested method that consumers are very open to. Include event-driven triggers, keep your message understated your and execution consistent, and you will see great gains from insurance postcard marketing.